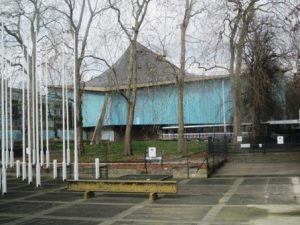 The Commonwealth Institute is a distinctive building on Kensington High Street south of Holland Park. It has a low brickwork plinth clad in blue-grey glazing surmounted by a complex hyperbolic paraboloid copper roof made with 25 tonnes of copper. The copper roof was restored in 2001 but has not regained its distinctive green colour; it is thought that this is because the oxidation of the copper is not occurring as quickly as it did in the 1960s when the building was first occupied because there are fewer corrosive sulphur compounds in the air. 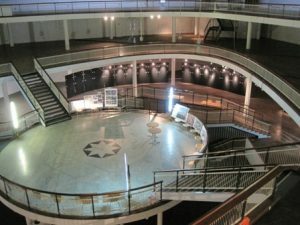 The building is currently unoccupied but the Design Museumintends to move into it in 2015 and the building will provide the Design Museum with three times more space than is currently available in their docklands premises. Work at the institute site has now started with founder of the Design Museum Sir Terence Conran, along with several other persons, attending a ground breaking ceremony on 18 September 2012. The Commonwealth Institute is not currently open to the public.